>This blog post contains affiliate links. Click here to learn more what it means. It seems like a long time ago since I began my AIP journey, a little over 3 years, I have adapted well into this way of eating riding some ups and downs along the way but I rarely miss foods from the AVOID list anymore; however, there are still spices I wish I can reintroduce back into my cooking. As my gut healed, I was able to slowly reintroduce some spices but not enough to create one of my favorite belly warming dish - the Curry! 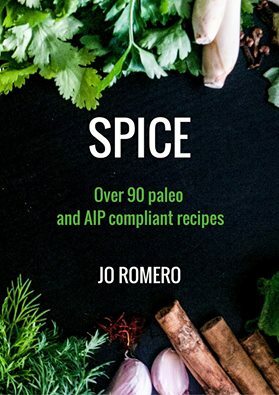 So when I heard about this Paleo and AIP compliant book about SPICE Jo was working on, I was eagerly filled with anticipation. To begin, Jo starts out with the list and detail glossary of AIP Compliant Spices and Aromatics. I have to admit there are many ingredients on the list I haven't used before and now am looking forward to playing around with them soon. 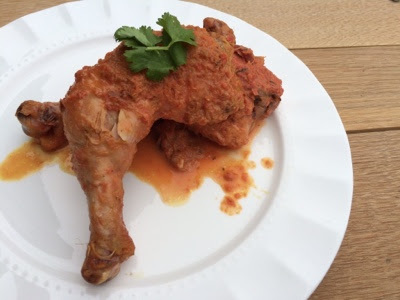 After drooling over the numerous beautifully shot delicious spicy dishes, I chose to make the Basic AIP Red Thai Curry Paste over chicken legs. 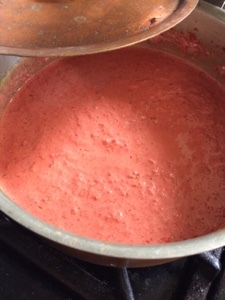 Don't let the seemingly long list of ingredients intimate you, it is well worth it. The dish turned out so well that it even got a thumbs up from my husband who has Caribbean roots. Jo's AIP Red Thai Curry Paste offers a different kinds of heat, that is pleasantly fleeting instead of painfuling lingering past t's welcome, in comparison to traditional chilis. With just the right amount of kick, the dish is packed with complex aromatic flavors from the perfectly complimenting ingredients. I highly recommend this ebook to anyone, whether they are on AIP/ Paleo journey or not, to try as I have learned so much in how to combine spices and create fresh new taste to Spice up my cooking.